Protein puffs (isolated soy protein, rice flour, cocoa powder, calcium carbonate), milk chocolate (sugar, cocoa butter, milk, chocolate liquor, soy lecithin [an emulsifier], vanilla), dark chocolate flavored coating (maltitol, chocolate liquor, cocoa butter, cocoa powder [processed with alkali], milk fat, soy lecithin [an emulsifer], vanilla, salt), gum arabic, confectioners glaze (food glaze, vegetable oil). Contains milk and soy. May contain peanuts, tree nuts. Peanut flavored coating (palm kernel oil, sugar, partially defatted peanut flour, maltitol, whey protein concentrate, nonfat dry milk, peanut oil, salt, soy lecithin [an emulsifier], stevia leaf extract), protein puffs (soy protein isolate, rice flour, calcium carbonate), gum arabic, confectioners glaze (food glaze, vegetable). Contains milk, soy and peanut ingredients. May contain tree nuts. Pure Protein Crunch makes snacking easy and fun by providing 10 grams of protein in bite-sized, crunchy, chocolate crisps and scrumptious peanut butter flavor-packed bites. They're made with non-GMO ingredients and are gluten free - the perfect convenient snack for energy on the go! 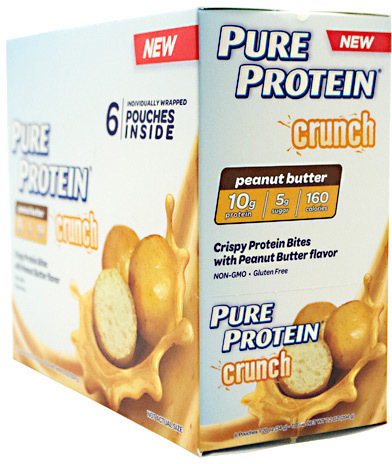 Pure Protein Crunch Bites are a convenient way to get in a healthy snack wherever you go and provides 10 grams of protein per serving so you can stay replenished and continue to build muscle even in a snack-sized pack.